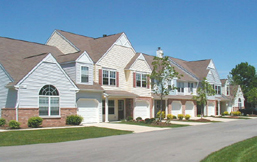 This townhouse community was built in Fishers, north of Indianapolis, IN. 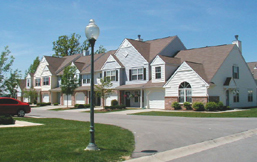 Five unit types were available, with one master-down end unit plan. All models featured a one-car garage and various options including a screened-in porch. Models were in the 1,200-1,500 SF range that yielded 8 DU/AC. A central pool and pool house doubled as an entry feature.